June 28, 2014 Mary Kate wins ITU Chicago World Paratriathlon Event.. Click here to read more about it. 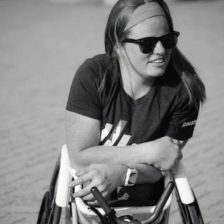 Nothing could stop Mary Kate Callahan from winning — or from smiling — during the ITU World Paratriathlon Chicago. Not a substandard swim. Not a mechanical issue on her handcycle. With dozens of family and friends looking on Saturday from the Buckingham Foundation plaza, Callahan was determined to cross the finish line in first place in the PT1 division. That single-mindedness is what makes her a world-class athlete, said Callahan’s coach, Mark Sortino. Callahan toured the course — a 750-meter swim in Monroe Harbor, and 20-kilometer bike ride and 5-kilometer run up and down Columbus Drive— in a time of 1 hour, 32.31 minutes. The victory kept Callahan, who is paralyzed from the waist down, the top-ranked American woman in the PT1 category and boosted her to No. 2 in the ITU’s Paratriathlon World Ranking behind Great Britain’s Jane Egan. Callahan trailed until the transition between the bike and run, and the LaGrange resident said having her own cheering section helped push her along, five days shy of her 19th birthday. Back during her Fenwick days, she showed her determination while fighting the IHSA to add state competitions for disabled athletes. She got her way her senior year, in time to participate in her first state swim meet. By then, Callahan had already been competing in triathlons since 2010. She said she was immediately addicted to the sport. Now, she has her sights set on making the 2016 Paralympic Games in Rio de Janeiro. It will be the first time the paratriathlon is contested at that level. But Callahan isn’t getting ahead of herself. She has another ITU World Paratriathlon event July 19 in Magog, Canada. She said she’s hoping to qualify for the ITU World Triathlon Grand Final in Edmonton, Canada on Aug. 29. Callahan will spend the next couple of weeks training for the Magog race. She said she works out all over the Chicago area, including Chicago’s lakefront path, as well as the Morton Arboretum in Lisle. She also said she and Sortino will talk on the phone and communicate online to develop a game plan. Sortino was in Chicago on Saturday, but he went back to San Diego following the competition. As competitive and driven as Callahan is, Sortino said Callahan is someone who enjoys herself to the fullest. @MStockwell01 Right there with ya this AM - just with numbers in the pool! STRONGER EVERY DAY!